The 1970 season was, by many accounts, one of the most important in NHRA history. It marked the first season for a new class, Pro Stock, and the first time that a season champion would be crowned in a fledgling class known as Funny Car, which until then had run only sporadically – six times, to be exact -- since its inception in late 1966. 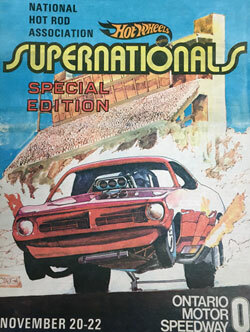 In 1970, the NHRA national event schedule also nearly doubled, from four events in 1969 to a whopping seven for what quickly became billed as NHRA’s “Super Season.” NHRA added two more season-themed events – the Springnationals and the Summernationals – to complement the well-established Winternationals as well as the cutely named Gatornationals in Florida and a second California event to be held at the newly constructed Taj Mahal of tracks, Ontario Motor Speedway, 50 miles outside of Los Angeles but just about the length of "In-A-Gadda-Da-Vida" down Interstate 10 from Pomona, home of the Winternationals. The Ontario event, being the finale to the “Super Season,” was, appropriately enough, named the Supernationals, and, as you will read in this column, it proved more than an apt name. 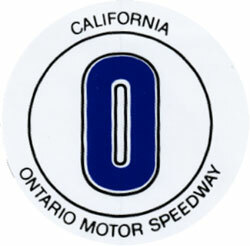 In its short 10-year run as an NHRA national event venue, Ontario Motor Speedway became known as the place to set records, an amazing feat considering that the soon-to-be-hallowed dragstrip also doubled as the pit lane for the oval track. Here’s a race-by-race look at the events that cemented “The Big O’s” place in drag racing lore. This week, the Supernationals events, 1970-73; next week, the World Finals, 1974-80. The Keeling & Clayton team originally wasn’t even part of the invited teams for the 1970 Supernationals, but got in when others could not attend, and Rick Ramsey made ‘em all pay by driving the California Charger, near lane, to the Top Fuel win. The NHRA Hot Wheels Supernationals, scheduled for Nov. 20-22, was sponsored by Mattel and its brand of miniature hot rods, then in its first full season of turning Don “the Snake” Prudhomme and Tom “the Mongoose” McEwen into household names with kids across the country. Because the event was held after the points-scoring season finale, the World Finals at Dallas Int'l Motor Speedway, entry to the event didn't need to be open to all, and a selection committee was charged with picking the 350 to 400 “top performers” and “superstars” who had the privilege of participating in the event. NHRA also decided that because points were not on the line, the event was the perfect place to test its new ProStart system, which featured one amber light instead of the traditional countdown Christmas Tree. The event also was aired live to television viewers in more than 70 cities on the American Telesports Network. Although fans and racers were wowed by the facility, with its enclosed garages, restaurants, theme-park-like spectator parking-lot shuttles, and the like, the first event – in fact, the first two – did not showcase the type of jaw-dropping performance with which the track would soon be associated. Although the dragstrip had been coated from start to finish with a sticky resin traction compound sprayed from a helicopter, the hoped-for 6.3-second runs never materialized. A number of drivers had run in the low 6.40s in 1969, but the best anyone could run in Ontario was 6.56, recorded by Danny Ongais in Carl Casper’s Young American in round two. Butch Maas was the low qualifier at 6.68 in Prudhomme’s Indy-winning Wynn’s Winder but was upset in round one by “the Loner,” Tony Nancy. Among those not making the 32-car 6.93 cut were Tommy Ivo, Chris Karamesines, newly crowned world champ Ronnie Martin, “Sneaky Pete” Robinson, Kelly Brown, Indy runner-up Jim Nicoll, and many more. Rick Ramsey drove John Keeling and Jerry Clayton's beautiful California Charger slingshot – which also was judged the meet’s Best Appearing Car -- to the Top Fuel win with a string of steady 6.60s and 6.70s, capped by a 6.70 to defeat tire-smoking Gerry Glenn. What was especially noteworthy about the win is that the team was not initially among the 64 Top Fuel invitees and got in only when a few other competitors had to withdraw. 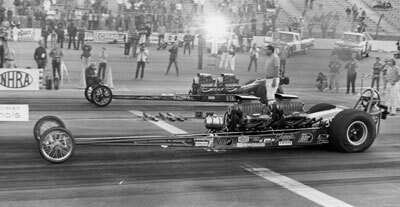 The other little-known fact about that final round is that Glenn had irreparably wounded his engine in the semifinals and, out of desperation, had transplanted the engine from Bill Schultz’s Top Gas dragster into his Top Fueler for the final, running it on methanol. Newly-crowned world champ Gene Snow took the Funny Car title with his Rambunctious Dodge Challenger. Sush Matsubara lost the handle on Joe Pisano’s Camaro in round one and crashed heavily, and an errant part broke the ankle of National Dragster photographer Leslie Lovett shortly after he snapped this photo. Newly crowned inaugural Funny Car champ Gene Snow showcased that title-winning form in beating the Ontario field, but low e.t. of 6.95 was a far cry from the 6.60s and 6.70s blasted at Lions and Orange County Int’l Raceway that same week. Prudhomme did event sponsor Mattel proud by putting his Hot Wheels 'Cuda at the top of the qualifying sheets with a 7.044, just a thousandth ahead of "Big Jim" Dunn’s similar mount, but, like teammate Maas, “the Snake” was on the sidelines after round one, his banishment courtesy of Richard Tharp and the Blue Max. Prudhomme’s Hot Wheels teammate McEwen didn’t crack the tough field, but he had good company in Jim Liberman, Tom Hoover, the Chi-Town Hustler, and the Ramchargers, among others. Eliminations were marred by a nasty crash in round one by Sush Matsubara, who got loose, hit the opposite-lane guardwall head-on, then rolled. National Dragster Photo Editor Leslie Lovett, standing trackside downtrack, was struck with a shock absorber, breaking his ankle. He was carted off to the hospital for treatment but returned in time to shoot the final rounds. Both Snow, in his Rambunctious Challenger, and final-round opponent Larry Arnold, in T.B. Smallwood's Kingfish Barracuda, wounded their mounts in respective semifinal conquests of Dunn and Tharp, Snow burning three pistons and both cylinder heads and Arnold wounding three crankshaft bearings and the transmission. Both needed an extra 15 minutes to make the final-round call – spectators helped Snow push his car to the line while he hurried behind them, still trying to don his firesuit – yet, despite that allowance, neither appeared in top form as both “snorted and popped down the strip,” according to a National Dragster reporter. Snow got there first, 7.49 to Arnold's 8.68. World champ Ronnie Sox won his third event of the season in Pro Stock, repeating his World Finals final-round victory over "Akron Arlen" Vanke, 9.85 to 9.92. Don Cain picked up the Top Gas win in the Pusch & Cain machine when Ray Hadford red-lighted while Don Enriquez drove his A/FD to the Comp title. Modified went to Jim Stevens, Super Stock to world champion Ray Alley, and Stock to Marv Ripes. Hank Johnson, near lane, scored his first career win when he defeated John Wiebe in the 1971 Top Fuel final. It was the last all-front-engined Top Fuel final in history. Ronnie Sox dominated Pro Stock in 1971, but his win was not without controversy. Jim Bucher, near lane, red-lighted and lost the last Top Gas final ever held but later was declared the winner when opponent Ken Ellis was disqualified. “Kansas John” Wiebe had low e.t of the 1971 race, but his 6.53 was only a marginal improvement over Ongais’ 6.56 and nowhere near Don Garlits’ 6.21 low e.t. pass from that year’s U.S. Nationals. While OMS lived up to its legend as a supertrack in racer and fan amenities, the performance part of that legend would not crystalize for another year. Wiebe, with power from the revolutionary new Donovan 417 engine – an aftermarket aluminum version of the workhorse Chrysler 392 -- didn’t win the race, falling in an upset in the final round to the No. 2 qualifier, “Gentleman Hank” Johnson, and his Washington state-based machine. The final round – the last in NHRA history between two front-engine Top Fuelers – was charged with drama as the drivers took part in a protracted staging duel, not unlike the one that had occurred two months earlier between Steve Carbone and Garlits in Indy. Johnson got the win, the first of his career, with a run of 6.61 seconds. The event also will be remembered for the Top Fuel debut of 17-year-old Jeb Allen, who went all the way to the semifinals before being eliminated by Wiebe. Funny Car e.t.s were a little more respectable; low e.t. was 6.84 – one of the top five runs of the year but nowhere near Leroy Goldstein’s stunning 6.71 from that year’s Gatornationals -- a time recorded both by Don Schumacher in round two and in the final by the event winner, Arnold, who made up for 1970’s disappointing runner-up by going the distance in 1971 with his Kingfish entry for his first win. 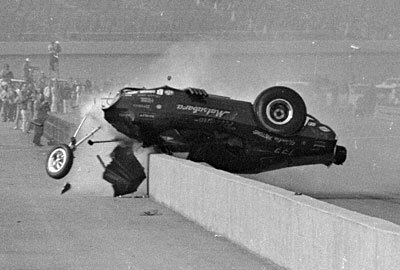 Arnold’s final-round victim was Mike Snively, whose effort behind the butterfly of “Big John” Mazmanian’s Barracuda was thwarted by a broken rear end. Like Arnold, Snively would only have to wait a year for a better fate at Ontario. Pro Stock was the scene of an incredible tech hullabaloo in the semifinals. Butch Leal had been vowing all year to stop the rampage of Sox, who by that time had won five of the year’s seven events – and his second straight championship -- and in Ontario, it looked as if Leal finally got the job done when he turned on the win light ahead of the talented North Carolinian in the semifinals. But someone apparently dropped a dime on the famed “California Flash,” whose Duster was hauled off to the tech barn, where it was discovered to be in violation of the class’ weight-distribution rule with more than 55 percent of the weight on the rear wheels (57.2 percent). Sox was reinstated and went on to beat his teammate, Herb McCandless, in the final. Incredibly, the story did not end there. Questions then were raised about the legality of Sox’s Barracuda, and it took until Monday afternoon, and a thorough scrutiny of the car’s dimensions, before Sox was officially declared the event winner. Tech also played a major role in the Top Gas outcome, which was a shame because it was the last event for the fabled class – inaugurated at the 1963 Winternationals -- which was discontinued after 1971 and the entries absorbed into Comp eliminator. An hour after apparent winner Ken Ellis had collected the trophy, teardown revealed that the displacement of twin Chevy engines “substantially” exceeded the allowed 2.25 pounds per cubic inch weight break, and the win was awarded to “runner-up” Jim Bucher. Ellis had wowed everyone with low e.t. of 7.19 in the semifinals, which set off rumors in the pits regarding the car’s legality and no doubt led to Bucher’s desperate final-round red-light. Comp was won by Francis Crider, and Modified went to future Pro Stock racer Paul Blevins. Ron Mancini took Super Stock honors and Keith Berg the Stock trophy. 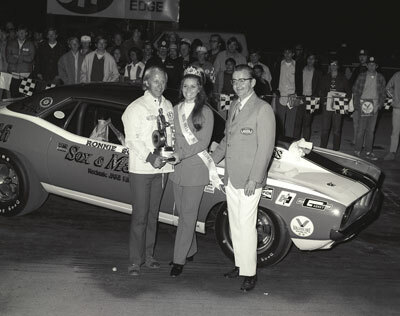 At the 1972 Supernationals, Jim Dunn became the first -- and the last -- driver to win Funny Car in a rear-engined entry. 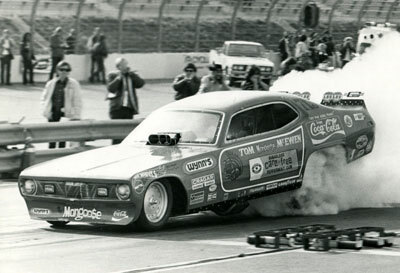 NHRA made a radical decision for the 1972 event, sidelining the Sportsman portion of the race in favor of an all-Pro format featuring 16-car fields in Top Fuel, Funny Car, Pro Stock, and Fuel Bike. What the race lacked in number of classes it more than made up for in histrionics, and the OMS dragstrip finally came into its own as a record-busting quarter-mile. (Above) Mike Snively, near lane, made history with the first five-second run, a 5.97, but it came on a losing semifinal race with Vic Brown. (Below) One round later, Don Moody dismantled Snively's record with a 5.91 to win the event. 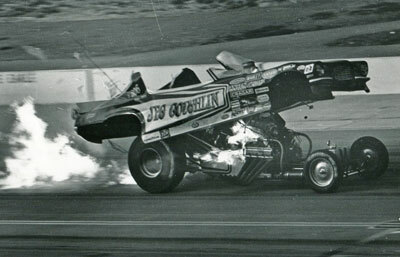 The five-second barrier, which had been under assault all season – and broken, unofficially, in the opinion of some, by Tommy Ivo at a Pennsylvania match race a month before the Supernationals – was officially toppled in the semifinals of Top Fuel when 1971 Funny Car runner-up Mike Snively powered “Diamond Jim” Annin’s wheel-pants-equipped dragster to a 5.97. The downside to Snively’s feat was that it came on a losing run, falling on a holeshot to Vic Brown’s 6.03. Fans had barely had time to digest Snively’s historic pass when Don Moody destroyed the mark with a 5.91 in the final round to defeat Brown. If you remember a column I did with Moody way back in 2008 (read it here), he easily could have gotten that first five if he hadn’t shut off early on a 6.01, 202-mph semifinal run. Also worth noting was that Danny Ongais ran the sport’s fastest speed, 243.24 mph, in the Rossi & Lisa wedge in qualifying, but his accompanying 6.27 e.t. wasn’t quick enough to make the top 16, which was the quickest in history by a wide margin. It took a 6.26 to make the field, and even the first 16 alternates also were in at 6.40 and quicker, more than two-tenths quicker than the previous best 16-car bump spot of 6.62, set earlier that year at the Summernationals. 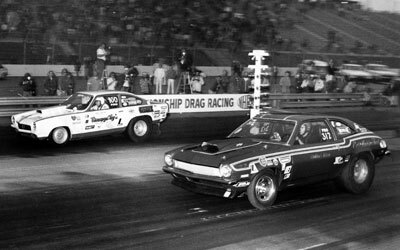 Funny Car also boasted a first – and, in historic hindsight, an “only” – when Dunn drove his rear-engine Barracuda to a surprising victory. Although rear-engine Top Fuelers had become the norm, the dozen or so back-motor floppers that had emerged had met scant success and mostly mayhem, but Dunn’s Woody Gilmore creation proved that, at least on occasion, the concept could work. The Funny Cars, too, hit their stride on the Ontario strip, with Jim Murphy busting into the 6.30s – a feat accomplished only once previously, by Bobby Rowe at a match race – with a stunning 6.33 low qualifier that, in much the same way Moody upstaged Snively, was bested three times in eliminations by Pat Foster, who cracked the whip on the famed Barry Setzer Vega to runs of 6.29. 6.30, and 6.31 but stunningly fouled in the final against Dunn, whose race best had been a 6.44 in the semi’s. Foster also set top speed at 235.64 mph, the fastest ever by a Funny Car. Like Top Fuel, Funny Car boasted the quickest field ever, with Gary Henderson’s 6.51 on the bump, beating by more than a tenth the 6.64 bump from that year’s U.S. Nationals. Bill Jenkins, far lane, won Pro Stock over some newcomer named Bob Glidden. 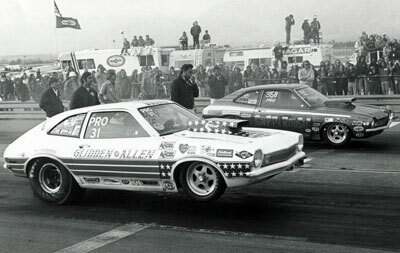 Pro Stock was won by Bill Jenkins – no surprise as he had won four of the season’s previous six races in his revolutionary Vega – but the surprise was his final-round opponent, a fledgling Indiana Pro Stock racer competing in his first national event named Bob Glidden. Jenkins won the final on a holeshot, 9.38, to 9.37, but that obviously was not the last we would hear of Mr. Glidden and his Pinto. The Fuel Bikes also made their quickest passes ever. Danny Johnson's twin Harley-Davidson qualified No. 1 with an 8.72 – the best ever for the breed -- but lost in round one, opening the door for unheralded T.C. Christenson, the No. 2 qualifier who rode his twin-Norton powered entry to stunning blasts of 8.59 and 8.52 during eliminations to claim the title. As impressive as those numbers were, it’s funny to think that these twin-engine, nitro-fueled bikes wouldn’t hold a candle to today’s gas-powered Pro Stock Motorcycles that run 6.70s. So, how did Ontario go from a so-so performance track in 1970 and 1971 to the killer strip in 1972? A couple of theories were advanced at the time, including a heavy rain before the event that scrubbed the track and a thorough prepping of the track using a special traction compound, but a lot of others pointed to the fact that the absence of Sportsman competition kept the surface to one basic type of tire rubber constantly being laid down and not scrubbed off or potentially leaked on by hundreds of Sportsman cars. (Above) Tom McEwen soloed in the Funny Car final for his first national event win after Dale Emery was not able to return after an explosive incident in Jeg Coughlin's Camaro (below) in winning his semifinal round. Don Garlits was unbeatable in Top Fuel, running all fives in eliminations and resetting both ends of the national record at 5.78, 247.25 mph. Bob Glidden, near lane, settled for runner-up honors for the second year in a row, this time to Wayne Gapp, though both made national-record runs in the final. NHRA retained the all-Pro format for the 1973 race – but expanded it to include the new Pro Comp class for alcohol-burning dragsters and Funny Cars -- which allowed the entry list to swell to more than 60 Top Fuel cars and more than 40 nitro Funny Cars. Rain that had wreaked havoc on the season opener in Pomona returned to haunt the season finale, wiping out Saturday’s qualifying and returning Sunday, when NHRA tried to hold a combo qualifying/eliminations day, forcing the conclusion to the following weekend, but the first weekend was filled by more Ontario magic. Four Top Fuel drivers ran in the fives, led by Don Garlits’ monstrous 5.80 – a tenth quicker than the 5.90 national record he already owned – followed by John Stewart (5.92), Dan Richins (5.93), and Larry Dixon (5.94), all of whom gained entry to the Cragar Five-Second Club with their passes. Garlits also ran the fastest speed ever, 247.25, raising the possibility of the sport’s first 250-mph run, though it would take Garlits two more years to accomplish that feat at – where else? – Ontario. Don Prudhomme also dropped the hammer on the Funny Car field, streaking to a 6.16 that was the best official number for a Funny Car by more than a tenth, bettering Pat Foster’s 6.29 from the previous year and the matching 6.29 that Bobby Rowe had recorded at the World Finals a few weeks earlier. Gene Snow’s 6.34 was a distant second. Prudhomme said that he thought that 6.0s were within reach thanks to Ontario’s famous “bite,” but, alas, that also would be an accomplishment two years down the road. Funny Car qualifying also provided the beginning of what turned out to be amazing turn of events for one of the sport’s most-loved drivers. Rowe powered the Mr. Ed Satellite into the field in the No. 6 spot with a 6.41 in Sunday’s short-lived action but lost the engine and rode out a big fireball before colliding with the Turn 1 wall of the oval. Rowe suffered a back injury and had to withdraw from the race, allowing the No. 17 driver into the field. That driver was the fabled “Mongoose,” Tom McEwen, who also had failed to qualify at the first two Supernationals. McEwen took full advantage of the situation and parlayed it and a little luck into his first NHRA national event victory. McEwen beat Dave Condit, defending event champ Jim Dunn, and Jim Nicoll with a 6.59 and a pair of 6.50s and exited his car at the top end after the semifinals looking forward to possibly facing his Hot Wheels teammate Prudhomme in the final. Prudhomme, however, broke the rear end against Dale Emery in Jeg Coughlin’s Camaro, then had a front-row seat as a massive blower explosion blew the body off of Emery’s ride just as it reached the finish line. Emery clipped the end of the concrete retaining wall, spun, and flipped over some hay bales along the track. The car was obviously beyond repair, and McEwen soloed for the title with a 6.60. 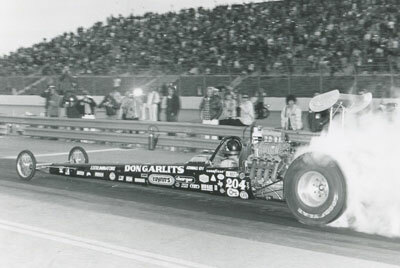 Garlits’ Top Fuel win also ended with a bye run, not that anyone could have beaten “Big Daddy” that weekend. Garlits ran in the fives in all four rounds – not one of the other 15 qualified drivers ran in the fives even once in eliminations – running 5.98 to beat Carl Olson, 5.86 to beat recent Insider profile subject Randy Allison, and a first-in-the-5.70s 5.79 to derail Dan Richins’ Iron Horse in the semifinals. The other semifinal win went to Gaines Markley over another of our recent Teen Terrors, John Stewart, but Markley’s Assassin blew the blower in the lights, which took out the rear tires, the wing, and, ultimately, the rear end. The car slid into the infield grass and did a soft roll before coming to a stop. Markley was unhurt, but it was obvious he wasn’t going to make the final, either. Garlits, being Garlits, didn’t let up just because no one was in the other lane and hammered out a 5.78 to reset the national record and seal his class-leading 10th national event win. Wayne Gapp won Pro Stock, besting Glidden in the final round, 8.87 to 8.96. Gapp's e.t. was a national record, and Glidden didn't walk away empty-handed either as his losing speed of 152.80 set the other end of the standard. Enriquez won the Supernationals again and became NHRA’s first Pro Comp eliminator winner, wheeling John Rasmussen’s Gene Adams-prepped A/Fuel Dragster to a final-round victory over Ken Veney’s A/Funny Car. Enriquez lost the engine on his final-round 7.02 or might have clocked the class’ first six-second run. T.C. Christenson wrapped up the list of event winners as he piloted his twin-Norton bike to the two-wheel title, beating Jim Priesler's twin Harley, 8.49 to 8.52. So, as you can see, over time, the Supernationals more than lived up to the hype and expectations of a race with a name like that. Beginning in 1974, the race became the World Finals, and even though the name changed, the drama and the performance lived on. We’ll take a look at those races next week.